I love Christmas. There, I said it. I know, it’s completely unorthodox for this Orthodox Jewess to love Christmas, but I just do. I have loved the holiday for as long as I can remember. Growing up, I got all giddy thinking about the upcoming holiday as more and more homes hung lights, the stores started playing Christmas carols and people were so much nicer to one another. It also helped when the weather participated, and the snowy December’s were always extra wonderful for me (not for my Father, mind you, who cursed every single time he had to shovel the driveway and walkways). In High School, I memorized the words to every single Carol I could get my hands on, and would serenade my bus driver when he was forced to work his holiday to shuttle us to and from Yeshiva. I figured it was the nice thing to do since he worked Christmas Eve and Christmas morning, to make sure we made it on time to school. As I grew up, moved out of my parents home and into my various apartments in Manhattan, my love for the holiday grew and flourished. Through my work experiences, I made some really good friends who weren’t Jewish. For weeks before Christmas, we would get together for drinks and gift swapping. My friend Jenny was a fabulous baker and she would make us homemade fudge, peppermint cookies and chocolate dipped nuts. They were absolutely fabulous. I spent the better part of December going from holiday party to holiday party, drinking in the atmosphere and stuffing myself full of sugar cookies and egg nog. Chanukah paled in comparison to the celebrations we had counting down to Christmas. And, on Christmas eve, I would meet up with my Cousin and some friends and we would go to a movie, out for a Chinese dinner, and then walk around the quiet streets of Manhattan and just take in the lights. I would come home with a red nose, bright, happy eyes and surf the cable channels until I found the Yule log burning as Christmas carols played in the background. Jerusalem doesn’t have that Christmas feel, although Chanukah here IS a really exciting time. I am trying to husband that Christmas spirit and channel it into our Chanukah celebrations. I realized, now in my 34th year, that it’s not really the Christmas traditions I like per se, but the overall feel of the holiday season. And so, last week, I roasted some chestnuts in the oven (because they’re kosher and who says we CAN’T have chestnuts on Chanukah). DH and I got a babysitter and spent three hours Chanukah present shopping at the Malcha mall. They actually closed down one of the counters at Shilav – the baby/kids store – so that two workers could wrap all the presents we bought for Baby J. I know, we will be spoiling her rotten for 8 days, but I do want her to LOVE the holiday season. And not just because it means gifts, but because it’s a special time that we spend with our loved ones. When we look at the blessings we have, when we cherish those dearest to us, when we give Thanks that we are together, healthy and want for practically nothing. Granted, these are obviously NOT the messages of the Chanukah holiday, but if that’s the FEELING she gets from celebrating the eight days with us, then I’ll be a very happy Hipstermom. 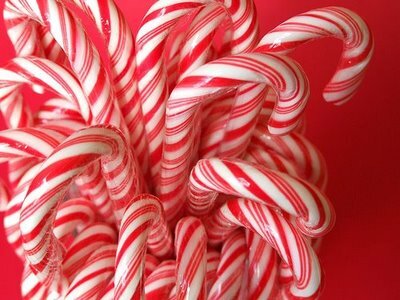 I’m still on a hunt throughout the City for candy canes, they are my absolutely favorite. I would eat them all year round, but there is something so wonderfully festive about having them out during this time of year. I know, it’s unorthodox, but I truly don’t care. They’re a kosher candy too, so I say “why not”. As for the music, well, let’s be real. Adam Sandler’s Chanukah song just doesn’t do it for me. If you see me shopping around Jerusalem this month, with headphones in my ears, chances are that I’m listening to my “Christmas Cheer” mix. Here are the songs on that playlist. I know, I know. It’s a completely unorthodox holiday tradition, but hey, that’s just how this Hipstermom likes to celebrate this holiday season! Do you have any Christmas/Chanukah cross overs? Are you Jewish but love the Christmas season? Let me know! The one song that was driving me insane yesterday was “I saw Mommy kissing Santa Claus”. I will find myself singing along in the stores, and then my kids will be shushing me – but there is something catchy about these tunes…. Wonderful stuff=D I am going to take a decent amount of time to toy with this blog. So funny you should mention candy canes in hot chocolate because I JUST found Nestle’s Mint Chocolate hot chocolate and am in heaven! All I need now is a candy cane to stir it with! !